From Square Enix and the “Star Ocean” series comes “Star Ocean: The Last Hope: International” to be released Feb. 9, 2010. “The Last Hope: International” for PS3 will include six language options in English, French, Italian, German, Spanish and Japanese. The story takes place after World War III, in the year 2087 when the earth has been decimated. Surviving countries joined together to form the Greater Unified Nations, and begin exploring space for a place to expand humankind. Players man their own spaceship, exploring planets and the vastness of space. Gameplay features dynamic four-person team combat and the ability to seamlessly switch between characters during battle. 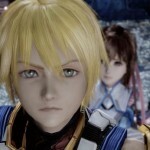 “Star Ocean: The Last Hope” launched earlier this year for the Xbox 360 console. Square Enix brings two of Japan’s best-selling franchises – Final Fantasy, which has sold over 85 million units worldwide, and Dragon Quest, which has sold over 50 million units worldwide – under one roof.